After watching the film, we were treated to some insights by the director. She was asked about how she got started in the industry and she began by talking about growing up in Tubbercurry, her pride in the place and the strength of community in her DNA, inherited from her late mother, Maeve and her Dad, Joe. 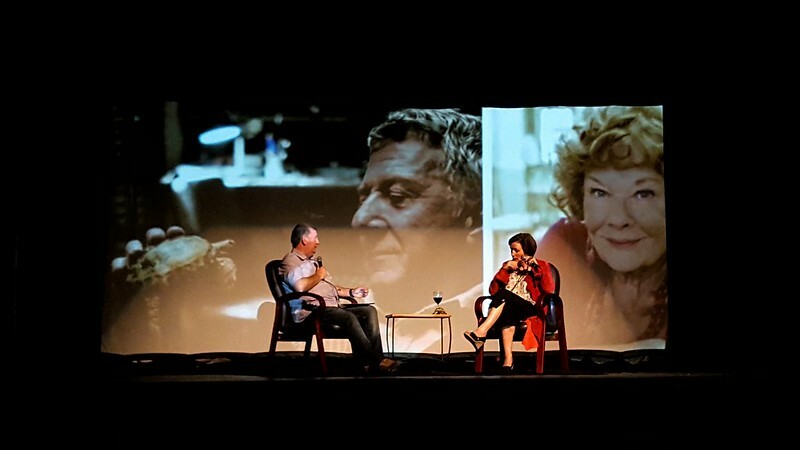 She credited Tubbercurry's lively drama community with giving her a firm foundation - likening her first exposure to television production in RTE to a St Brigid's Hall show - just with the constraints of the broadcast medium. She also spoke about being among the first cohorts of young women for whom real career opportunities were starting to appear in Ireland in the late 80s - not that long after the marriage ban was lifted in 1972. It's hard to even explain to our daughters now what the marriage ban even was - we've come a ways. We heard the backstory to the making of the movie with Judi Dench, Dustin Hoffman, 60 tortoises - and of course local stars, Barry Leonard & Mary Barry who also made an appearance. The number of moving parts to be coordinated for a film like this is staggering: schedules of the stars and their health concerns, budgets, set locations, crew, tortoises and tortoise wranglers all had to come together and work intensely for a few short weeks to make it happen. The Roald Dahl estate are notoriously protective of Dahl's work and restricted this production to the small screen - which is a pity as this is a blockbuster of a movie in all but distribution and technical detail. Under its sheen of warmth and laughter, the director pointed out the film's darker layer. When interviewed by the estate for the job, Roald Dahl's daughter remarked to her that this story lacks the darkness of most of his other works. But Dearbhla was struck even at that early stage about the dark themes hidden in plain sight: this story of two warm and kind people living within feet of each other and yet their potential for love and community was lost in lonliness year after year. The theme of community was a central strut of last night and was evident in every aspect of the event. On top of that traditional foundation, Dearbhla talked about how places like Tubbercurry are embracing difference and how crucial this has been in her own life and how it is a prerequisite for any young person starting out in their career and in life. She encouraged young people to travel and embrace other cultures, worldviews, sexualities, religions, races and learn to value difference and then balance that with the values of community. When we find the courage to do that, the world will teach us what we need to know. Wise words. By all accounts, Judi Dench and Dustin Hoffman are wonderful actors to work with - with Fun (with a capital F) being the order of the day. They entertain each other and the rest of the crew all day with stories and general naughtiness and they work hard - 9 hour shifts with no time for lunch. It cost nearly £50k a day to keep the crew running - time was money. Last night was a fundraiser for the very industrious Tidy Towns committee coordinated by Geraldine Brennan. Compere for the night was the consummate Peter Brennan (aka 'Snookums'). We had to leave - very unwillingly - at 11:20 due to other commitments and proceedings were still in full flight. A great night for all concerned, we thoroughly enjoyed it - thank you all!.